I like Jabrill alot, but the mistake he made was not having a position. That is going to cause him problems in the NFL. They can say he fits well in the "new NFL", but at the end of the day, he has to find a place to play. And not every team is going to be able to find a way to use him. I'd honestly be surprised if he goes top 10. Honestly wouldn't be surprised if he slips further down into the first round. He's an odd player for a lot of teams to use a #1 pick on. Best of luck to Peppers. Definitely one of the most electrifying players to wear the Winged helmet and he seemed to have a good head on his shoulders. His Michigan career went by so fast, it's a little hard to say what his legacy is compared to other Michigan greats. Obviously B1G Freshman of the Year, Defensive Player of the Year, and All-American honors are quite a resume, but it does seem to be a little incomplete with how short of a time he was here. I can't blame him in the slightest for leaving, but I'm already playing the what-if game on if he stayed one more season or if he was used a little differently on both sides of the ball. Hopefully the lack of a clear position at Michigan won't hurt him too much in his NFL career. I don't get you guys saying he doesn't have a position. He's a FS/SS/LB hybrid. The only thing he wasn't asked to do I guess was be a FS. I would agree there will be some teams who will not grade him high on their board if they can't make use out of such a player. But for teams that can utilize this he should go high, as he is a pretty unique athlete. Would potentially give a defense a ton of flexibility with their calls and personnel. Well he's a bit small to start at LB and he's absolutely brutal in coverage, so he probably can't start at safety right away either. The fact that the ball skills and the coverage are both lacking hurts him. He's a bit small to be a typical 1st and 2nd down LB, true. I disagree with everything else in this post. He's got one one pick and awful coverage numbers. He played LB mostly at UM so he's not going to have a ton of picks. He's gonna be a lot better than most LBs and safeties that would be asked to defend WRs, and he'll cover TEs and RBs well. Peppers has started to fall down our board just a bit, as his play on the field as of late hasn’t quite lived up to his hype. While his elite athleticism and ability as a returner is blindingly apparent every time he steps on the field, his play on the back end has been less than stellar. When targeted in coverage this season, he has yielded receptions on 20 of 27 targets and does not have a single pass defended when he is the primary defender (his lone interception against Ohio State was a case of him being in the right place at the right time off a pass tipped in front of him). He also lacks the size to consistently take on and shed blocks going forward, as the majority of his impact plays this year have come when he has been unblocked. Teams considering him will need sell themselves on the idea that his coverage struggles could be due to his hybrid role, but it may be difficult for some to come to terms with the thought that he may be a two-down player at the next level. I'm not sure what your point is. As I said, he played LB, which is why he was only targeted 27 times, just over 2 times a game. I'm actually surprised it was that many. Maybe they're counting some WR screens, which he was probably the best in the country at blowing up for no gain. Michigan used him a lot around the LoS, and nobody is going to draft him to cover WRs full time. He's a guy that's a strong safety / linebacker in space against big sets and a guy that will handle the TE/RBs/4th receiver in passing or spread sets. He's a guy that can defend the pass in run sets and defend the run in pass sets, as long as he's not used as a CB on an island or as a LB in tight spaces. It shouldn't be very difficult to figure out how to use him. My WAG is he goes anywhere from 12-25. I don't really follow the draft much so who knows. So you think he can't cover a TE or RB? As I said, I disagree strongly. Watching the Michigan games, I don't recall him having issues covering or tackling a TE or RB. The 20/27, aside from being too small a sample size, does not address who he is covering. He did get beat a few times versus a WR, so I assumed that was your point. If you have a stat that says he's getting beat by guys he shouldn't be getting beat by, for substantitve yardage, I will change my opinion. But I haven't seen that. Otherwise, that blip does not address my assessment. I had read that before actually, which is why I think 12 to 25 versus something higher. He's not Charles Woodson, for sure. the worst possibility for Peppers is that he one of those guys who is blindingly fast as teen but has genes that are going to slow him down and bulk him up closer to 20 instead of giving him the years up to 30 first. Like those those occasional kids who come in as tailbacks as freshmen but end up FBs by their senior yr. I thought he looked much better in coverage last year than this year, and looked quicker in his offensive touches as well. Indeed by contrast, if anything, Woodson's speed just kept building year to year, and despite people early on predicting he'd be soon be a S in the NFL because of his size - he managed to play a decade at corner first. I'll be curious to see what kind of speed Peppers ends up with at 25. Can't? No, I didn't say that. What I said is that he currently does not do so well. Its hard to take a project in the top 10, arguably even in the first. Safeties, even hybrid ones, have to cover WRs a decent amount as well. The lack of playmaking is arguably a bigger concern. Heisman is voted on by people in the game, isn't it? I don't think he deserved an invite either but the voters did so whatever. Heisman is meaningless to me anyways, unless a Michigan player is gonna win it. At any rate, we disagree on his coverage abilities. I think he is and was more than fine vs. non WRs. And if he can't cover the occasional slot WR, a competent DC can minimize that. It's not a big deal anyways, we'll find out come April. The kid is going to be fine, I don't have much doubt about that. Before looking at side-by-side pics of Woodson and Peppers, I was tempted to say that Peppers had 10 lbs of muscle mass on Charles. But I'll tell you G2, if there is any difference I believe it to be negligible. As a body-type, the two appear to be two peas in a pod. To me at the time, Woodson was a straight-up playmaker in the mold of Welbourne because of his ball skills and rangy shooting guard-type of athletic ranginess. Maybe this was part of the reason why some thought he would transition to Safety? A guy that can cover sideline to sideline, tackle not only willingly, but surely and with authority, as well as have a genuine "nose" for the ball really is a unicorn. 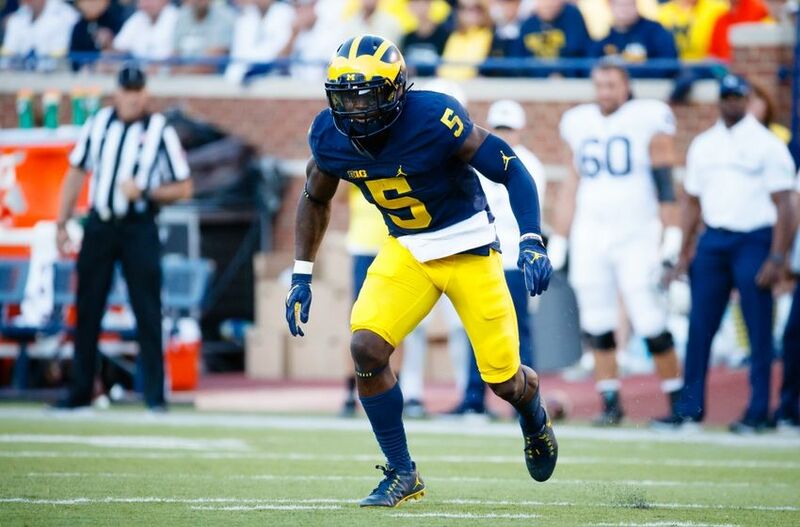 Peppers differs from these two guys, who are the two best Michigan defensive backs I've seen in my 36 years of watching Michigan football, in that he isn't leaving Michigan as a guy with a sixth-sense for the ball. That doesn't mean he can't be a very effective player in the NFL, but I do think it makes him a guy who will need the right system to shine. What you mentioned about speed is a great question--will he be a mid 4.4 range player in five years? Did he already peak? Will he get faster? Who knows? What I can tell you, is that a good speed coach can knock his 40 and short-shuttle time down to elite numbers (per position) with three months of training. I've seen miracles happen. If Peppers goes this route, he'll go very high. If he comes in and only places in the top 1/3 amongst Viper/Spur types, then he's gonna fall as much as a whole round. My way too early projections? A performance along these lines would make Peppers the top-10 pick Todd McShay thinks he is. I haven't seen many all-around performances like this at the NFL Combine, although it happens like every third year or so. good stuff. Maybe look at the thighs. Peppers looks a bit thicker-maybe, but I agree the external body confirmation is similar - I do think it's all in the speed aspect. I wonder if they had left him at corner and told him to forget about getting strong enough to play LB and just stay as fast as he could if that isn't where the greatest impact he could have on an NFL field would be. There are few things more valuable in the NFL than a shut down corner who is willing to support against the run. I will always wonder if JB could have been that guy if they had just kept him on that track (plus returns) and given him all his reps where he could fight for the ball. Maybe if M had had a stronger LB core they wouldn't have been so motivated to cash in some of his athleticism there, and maybe that was better for the team. Whether it was better for Jabril, I'm not so sure. I've read he is projected as a safety. Makes sense to me. Kind of a "tweener." Too small for a (O)LB, even in a 3-4, not quick enough for a corner. I don't know enough about the necessary size for an outside LB in the NFL. But I think he's going to be most valuable as a guy that can concentrate on trying to get into the backfield. You can always walk a safety down into the box, but I think there is something to be said for being able to attack from a linebacker spot rather than vacating the safety spot. Of course defensive alignments are all over the place. I don't think he's particularly great in coverage, but he's ok. I hope he has a lot of success. But I also can't help but feel the same way as I did when stauskas left. It was great when they were here, but it doesn't feel like they were here long enough. But when you get that draft projection where the big money is going to be there, it's hard to pass up and I don't blame either of them.